Solar Panels & Charging Kits. 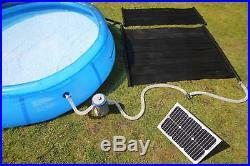 Total Solar Swimming Pool Hot Water Heater Mat PV Panel Pump Kit Free Sun Energy. 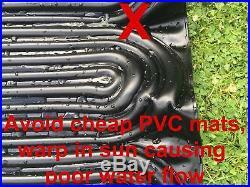 Solar Heating Mat (please ensure correct size mat is chosen), Solar Panel and Pump Only. Free sun powered heating and free sun powered electricity for the pump. Keep those dangerous extension leads and mains powered electricity well away from the water. Safe solar panel output voltage. 1pc EPDM/ NBR tough rubber mat (size dependent of choice - see below). 1pc Lowenergie 20W or 30W Solar Electricity Panel, 18 volt DC output, 1.12A, 20w (360 x 540 x 25mm) / 30w (550 x 450 x 25), connects directly to the pump. 1pc 12-24v Solar Water pump with 32mm (1.25 inch) pool pipe connectors, 420 Litres per hour circulation rate through the Solar collector which is sufficient. 2pcs, water intake & output pipe connections which will fit a standard 32mm pool hose. 2pcs, metal jubilee clips to ensure tight pipe connections. 1 Roll PTFE Tape for enabling good watertight pipe connections. 1pc, detailed 12 page user manual which also gives advice on expansion kits and larger solar pool heating applications. We now offer the mats in a choice of 3 sizes. 4sqm = 66cm x 600cm. 4sqm = 133cm x 300cm. Please ensure you select the correct size in the drop down boxes. 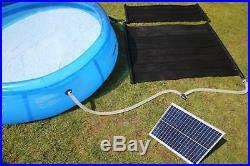 This solar pool heating kit is an environmentally friendly product using free heat from the sun. It works by absorbing heat from the sun's rays into the specially designed the heavy duty black matt material. Water is circulated through the pipes within the mat which is warmed up and in turn gives you and your kids a lovely warm pool which does not cost the earth and is certainly much cheaper than any other form of water heating. Our solar pool heating mat can increase the temperature of your pool by 3 to 5°C per day depending on the pool size and weather conditions. During testing, over 2 to 3 days we have used this product to increase a pool temperature from around 20°C to almost 36°C which is certainly very comfortable. We have chosen a tough NBR rubber material for our solar absorption mats which will have a long life and is UPVC degradation resistant. In our recent testing of similar products we found that the cheaper PVC solar absorption mats are very easily punctured but their biggest problem is that the PVC material warps in the heat of the sun which can restrict water flow (see photos). Solar Pool Heaters are eco-friendly and produce clean energy. They will not harm the environment and help to reduce carbon emissions. Solar Pool Heating Systems can significantly increase the seasons of the year you can comfortably use your pool which adds real value to your pool and home. 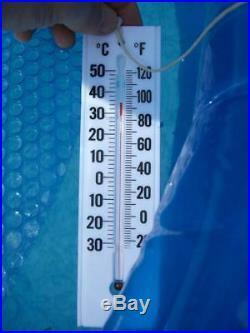 Solar Pool heating can pay for itself in a very short period of time, depending on the system used and installation. 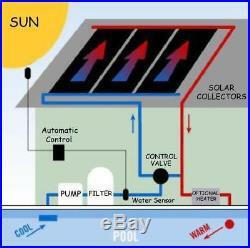 Solar Pool Heating Systems reduce your energy usage will give you real monetary savings every day. Our Solar Panel collector is made from EPDM/NBR, which is virtually immune to ultraviolet radiation and ozone. It is also highly resistant to pool chemicals and harsh climate. 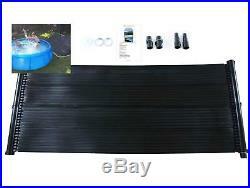 It is recommended that the solar pool heating mat is positioned as the same level as your pool so avoid pumping circulation water uphill which will reduce the water flow rate If the solar collector is mounted directly onto your lawn on a seasonal basis when your pool is in use, you may wish to lift if slightly above the grass as it does get very warm and can scorch the grass. Tilting the solar collector mat towards the sun will also increase its efficiency. 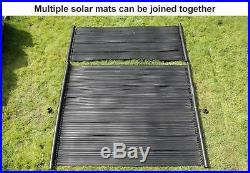 One or more solar collector mats can be joined together for increased heating capacity. Solar collector panels should be orientated to south in facing in the earth's northern hemisphere and in an un-shaded location. Calculation Example (Children's Play Pools) : Circular pool, 8 foot diameter (2.44M diameter). Pool diameter X pool diameter X average depth X 0.79. Calculate your pool water volume i. 2.44M x 2.44M x 0.5m in depth X 0.79 = Pool volume 2.35m3 (0.79 corrects water volume for the round pool). Recommended minimum panel coverage is 75% = 1.76 m2. So two 1m² solar collectors are recommended, or you can oversize the solar collectors to compensate for occasional cloudy conditions. Other Accessories you can consider for you pool. 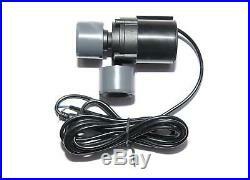 You can also use a standard Bestway/ Intex type pool filter, like shown on photos. Our solar pump can also push the water through the solar heating collector mat and filter although the flow rate may be lowered to around 360 litres per hour. To comply with all UK building regulations any electrical work should be carried out by a UK certified electrician. All electricity should be switched off prior to ANY electrical work being carried out. Low Energy Supermarket was founded in 2010, we offer various energy saving products which help to reduce the ever rising energy bills. We only offer quality products at a competitive price. Get all the Latest News, Updates and Special Offers about Our Store. We are pleased to accept the following credit cards. The item "Total Solar Swimming Pool Hot Water Heater Mat PV Panel Pump Kit Free Sun Energy" is in sale since Friday, May 06, 2016. This item is in the category "Garden & Patio\Swimming Pools & Hot Tubs\Other Swimming Pool & Hot Tub". The seller is "lowenergysupermarket" and is located in Warrington ** NO COLLECTIONS SORRY **. This item can be shipped to United Kingdom, Austria, Belgium, Bulgaria, Croatia, Cyprus, Czech republic, Denmark, Estonia, Finland, France, Germany, Greece, Hungary, Ireland, Italy, Latvia, Lithuania, Luxembourg, Malta, Netherlands, Poland, Portugal, Romania, Slovakia, Slovenia, Spain, Sweden, Australia, United States, Russian federation, Canada, Brazil, Japan, China, Israel, Hong Kong, Norway, Malaysia, Mexico, Singapore, South Korea, Switzerland, Taiwan, Thailand, Chile.